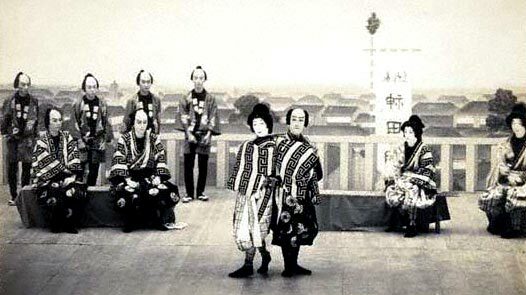 The Kiyomoto-based dance "Kanda Matsuri" was premiered in the 9th lunar month of 1839 at the Kawarasakiza under the title "Shimero Yare Iro no Kakegoe". It starred Sawamura Tosshô I, Onoe Eizaburô III and Ichikawa Ebizô V.
"Kanda Festival" is one of the festivals that best represent Edo. This song paints a rich picture of the Edo festival, the common attire and the townsfolk atmosphere against the lively festive background, and has been very popular for many many years. The characteristic of this piece is that the dances are filled with the bright spirit of the Edo festival, a flowery mood, and a chic sharpness that is said to be a distinguishing characteristic of a Kanda native. It is sure to be an enjoyable dance to see.